Honey bees have disappeared at a staggering rate over the last year, according to a new government report from the US Department of Agriculture (USDA). The numbers are significant and “troubling” and for the first time summer deaths have outnumbered the winter ones.This is the first time the USDA has released information about summer month bee losses, though it has gathered the information since 2010-2011. 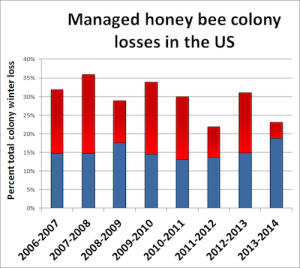 According to survey responses from about 6,100 beekeepers managing about 400,000 colonies, or roughly 15.5% of US bee colonies, losses of managed honey bee colonies rose to 42.1% from April 2014 through April 2015, up from 34.2% for 2013-2014. This is the second-highest annual loss on record said the USDA well above the 18.7% benchmark considered economically unsustainable. » Bee populations, especially in the US and Europe have been declining significantly for nearly a decade. » Research data suggests that a class of pesticides called neonicotinoids play an important role in this decline. » Bees are subject to many kinds of environmental stressors that may also affect their health including the same ‘factory farming’ conditions that are detrimental to the health of farm animals. » In order to address it effectively, we should be looking at bee health and colony collapse disorder in this wider context. The figures are shocking, but last year the USDA also warned that honeybees in the US were dying at a rate too high to ensure their long-term survival. Indeed as the chart (below) shows honeybees have been dying at an unsustainable rate primarily in the US (but also in Europe), for nearly a decade. So why is so little being done? Honey bees are inextricably linked to our health and well being and that of the planet. They are needed to pollinate plants that produce a quarter of the food that we consume. One of every three bites of food eaten worldwide depends on pollinators, especially bees, for a successful harvest. Beekeepers travel the country with managed hives to help the process. Beekeepers, environmental groups and some scientists blame a class of insecticide known as neonicotinoids, or neonics, used on crops such as corn as well as on plants used in lawns and gardens. Some lawn and garden retailers have cut the use of neonics. The European Union placed a two year moratorium on neonicotinoids in 2013, but they are still used in the US and elsewhere. The European Commission announced the decision three months after the European Food Safety Agency concluded that the pesticides represented a “high acute risk” to honeybees and other pollinators. Bayer, Syngenta and others that sell neonic products blame mite infestations and other factors, though Pettis argues that high summer losses over the last year weakened the mite argument as the mites are most active in winter. He said pesticide exposure was likely at least one factor. The Environmental Protection Agency has asked for a series of studies on neonic effects on bees and plans to release the first in a series of assessments later this year. Are neonics the only problem? The problem of colony collapse disorder is so huge and the temptation to pin it all on one ‘thing’ is great, and the impact of neonics is undeniable. But no one investigating the issue seriously would suggest that neonicotinoids are the sole cause of current bee declines. Entomologists, for example say that the cause of colony collapse disorder is likely a combination of factors – or ‘environmental stressors’- that includes the widespread use of pesticides and fungicides, as well as the spread of viral pathogens and parasitic mites in beehives. While mites and diseases have long been known to cause significant declines in domesticated bee populations, no single pathogen or parasite, say entomologists, appears to sufficiently explain the current rate of hive collapse. In an article I wrote some years ago for the Ecologist, when the crisis first became apparent, several other factors seemed to feed into the environmental stresses that might make bees more vulnerable to poor health and death. Many of these have to do with the ‘factory farm’ conditions in which we keep bees. Overcrowding Industrial-size colonies may have a bigger market value but they also bring the same problems to bees that industrial poultry farmers have visited on their chickens and turkeys: the easy spread of disease. Intensive bee farming In a normal colony the queen can live and produce eggs for several years. 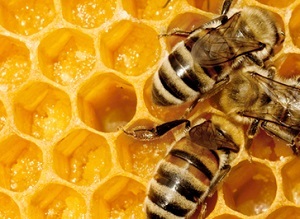 In commercial beekeeping, breeding better queens is a profitable business and queens are regularly killed and replaced – sometimes as often as every six months. The queen is often subjected to the stress of having her wings clipped to identify her and also to temporarily prevent ‘swarming’ – when bees leave one colony, with a new queen and form another one elsewhere (the natural way for bees to ensure their survival and genetic diversity). Parasites Bee populations have been affected by two types of mite infestations in recent years: a tracheal mite and the varroa mite that attacks the intestines. Varroa, in particular, depresses the bees’ immune response, making it more prone to infection. In a healthy colony, varroa could to some degree be seen as useful, helping to cull the weaker members. But in already weakened artificial colonies they can be devastating. Pesticides Pesticides used on food crops and other crops can affect bees, even at sub-lethal doses. Exposure can produce a kind of pesticide intoxication that makes the bees appear ‘drunk’, disrupts navigation, feeding behaviour, memory, learning and egg laying. GM crops GM plants account for around 40% of US cornfields. A series of small studies from the University of Jena in Germany found that pollen from Bt corn made the bees more vulnerable to death as a result of carrying the varroa mite. The bacterial toxin in the GM corn appeared to alter the surface of the bees’ intestines, weakening them enough to allow the parasites to gain entry. Electromagnetic fields As stories of CCD became more prominent, other theories have emerged. Mobile phones and overhead power lines have been blamed for interfering with bees’ homing radar and preventing them from getting back to their colonies. The accumulated losses in bee populations over the last decade goes beyond troubling. given all we know and what is at stake it’s worth asking. how great does the loss have to be, and how long does it have to go on, before accept the man-made aspects of CCD and also take action to change our behaviour?